If you’re considering coating your concrete with an epoxy or resin coat, you’ll want to clean it first. Cleaning your concrete with a pressure washer is an excellent solution to ensure that your surface is entirely dirt and dust free. Moreover, pressure washing is fast, thorough, and the ideal way to prepare your drive for a sealant. Pressure washing can be performed in an hour or so for most driveways. Since pressure washing a driveway is quick, it’s easier to wash the drive and apply the sealant coat within the same day. When you book an appointment with Big Clean to have your driveway power washed, be sure to set up an early appointment so that the driveway has plenty of time to drive before sealant coating. Pressure washing and sealant coating are best performed on warm, sunny days due to speedy evaporation. Sweeping your driveway free of debris simply isn’t sufficient to prepare it for a sealant. Using our pressure washing services ensures that debris, dirt, and mold are pulled up and cleared away. Concrete is naturally porous, and it requires a deep clean to rid the surface of mold and dirt that might otherwise flake off after applying a sealant. With a deeper clean, you’ll get a sealed surface that’s more pristine. Regardless of the size of your concrete driveway or deck, you can count on the pro pressure cleaners here at Big Clean HQ to get the job done quick, and to get the job done right. 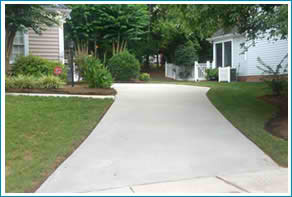 Call on us to prep your driveway for a sealant!